It's been a while, huh? The weather has been so weird lately and I am at a loss as to what to wear these days. I feel like I wore the same jeans+striped shirt+scarf combination over and over and it just felt the same even though they were different pieces. It seems that when I'm in the mood to wear a big sweater and boots, it's sunny & 70 (not complaining) and when I'm in the mood to wear maxi skirts and chambray tops, it decides to snow 10 inches. Reeeeeal cool, Colorado. Way to keep me on my toes. 36 week bump! We're getting SO close, y'all :) Despite the gross cloudy weather that prefaced the snow storm, I decided to rock this neon spring sweater from RiffRaff paired with a cobalt statement necklace, maternity skinnies (shocker), and my favorite casual sneakers. 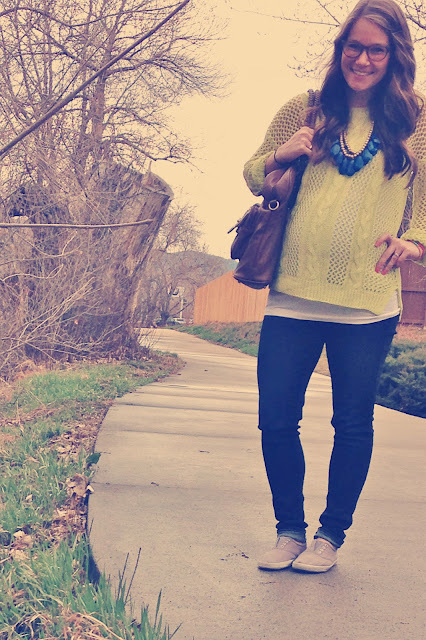 I never thought that as a pregnant woman I would want to wear a neon sweater to draw more attention to my pregnant-ness, but alas, I was totally digging it. I certainly didn't shy away from color in this outfit. And again, pregnant gals...I just want to emphasize that you don't have to buy overpriced, side-ruched maternity tops. 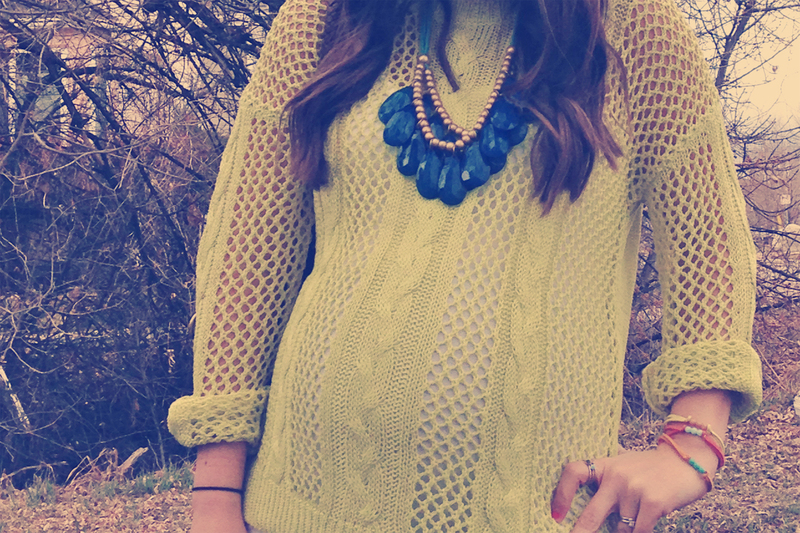 Just don't be afraid to size up a size (or two) and make sure you have layering pieces to cover the bump. You look ADORABLE! Love the sweater! OMG you are too adorable in that neon sweater!!! and your blue necklace with the bright yellow is perfect. you are just glowing!!!! congrats on 36 weeks! You look fantastic! 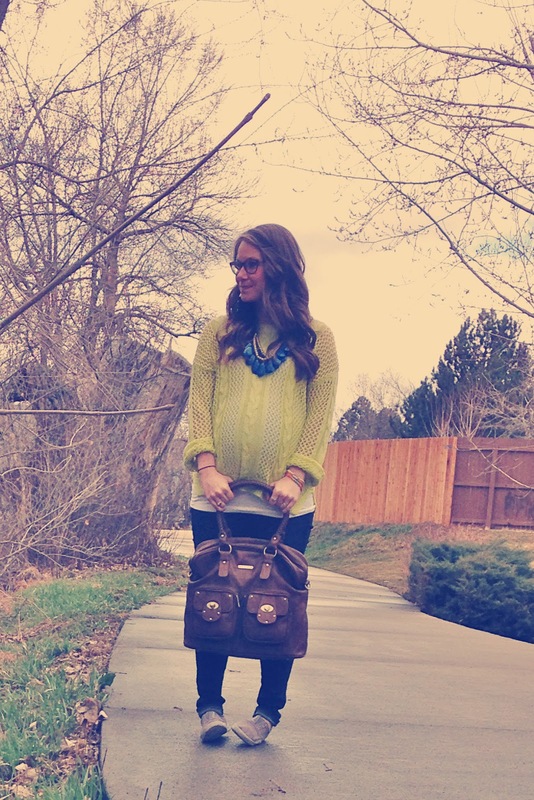 Love the diaper bag! 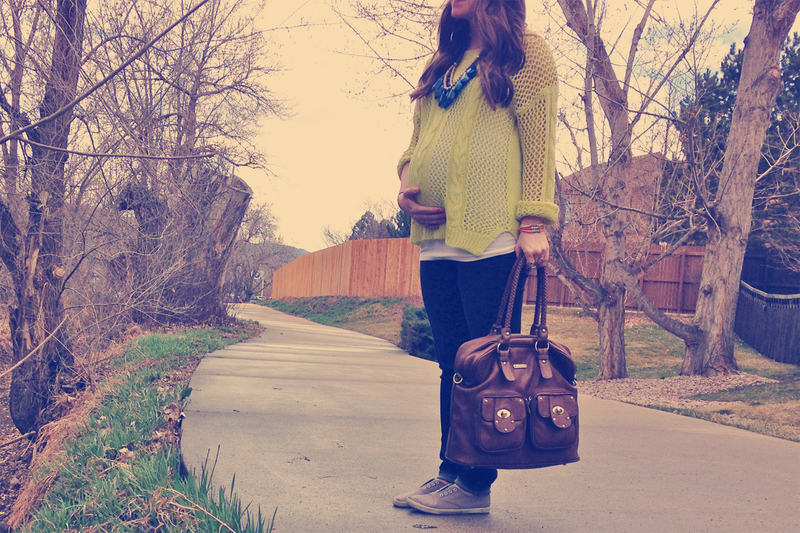 that is the BEST diaper bag I have ever seen... it doesn't look like a diaper bag at ALL. Love it! and I love your neon sweater. rock it lady!